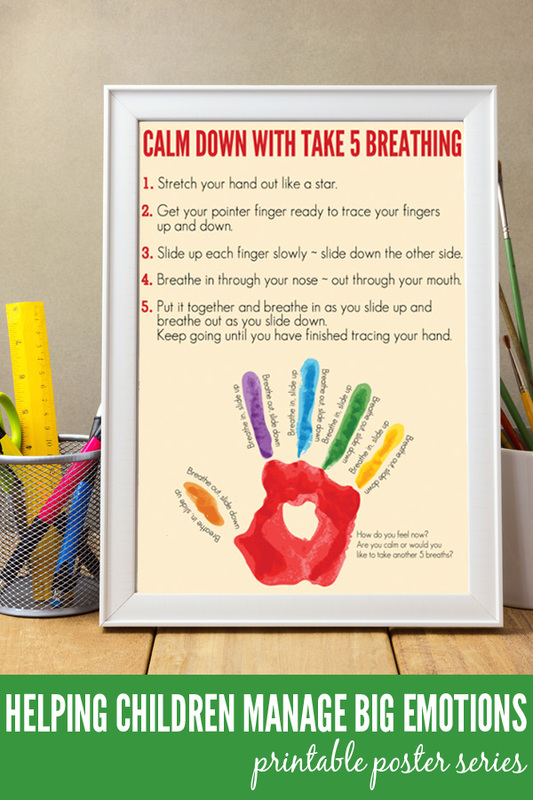 Today I am excited to team up with the lovely Leonie MacDonald of Relax Kids Canberra to bring you part four of the Managing Big Emotions printable poster series (you can find poster one here, poster two here and poster three here). Leonie is sharing a simple breathing technique (and tips for introducing the breathing exercise) that can help children (and adults) learn to manage their big emotions and calm down. When we are stressed or upset nature’s ‘fight or flight’ response takes over, increasing our heart rate, making our breathing fast and shallow, and sending blood from our brain out to our limbs ready to escape or challenge the perceived threat or danger. While stress hormones are flooding our bodies and we are gripped by this programmed response it is very hard to slow down, become calm, express our feelings or think rationally about what is happening to us and how we are responding. Our thought processes and self-control are actually hindered by our biological stress response. When stressed, children may experience an additional layer of fear or distress as they feel out of control and overwhelmed, not understanding what is happening to them or why. As adults, we are more aware of our feelings and of the physiological changes that come with these, but even we may have a hard time managing our own behaviour. What is Take 5 Breathing? Spread your hand and stretch your fingers out like a star. You can choose your left hand or your right hand. Pretend the pointer finger of your other hand is a pencil and imagine you are going to trace around the outline of your hand and fingers. Start at the bottom of your thumb and slide your finger up your thumb, pause at the top, and then slide your finger down the other side. Now slide your pointer up your second finger, pause, and slide down the other side. 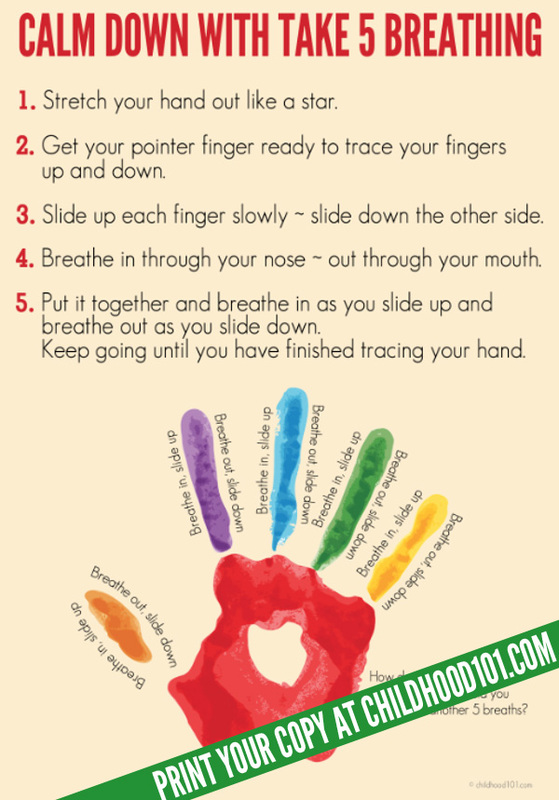 Continue tracing your fingers up, pause, and down. Slide your finger slowly, watch your finger move and notice how it feels. Keep going until you have finished tracing your fifth finger (pinky). Now you are ready to add some breathing. Breathe in through your nose and breathe out through your mouth. Remember to keep it slow and steady. How does your body feel now? Do you feel calm or would you like to take another five? Trace an outline of their hand on a piece of card and they can trace their finger along the outline. You can create a textured outline or cut out the shape if this works better. An alternative that involves no touching is to stretch their fingers out like candles on a cake and slowly blow each candle out and tuck the finger into the palm. 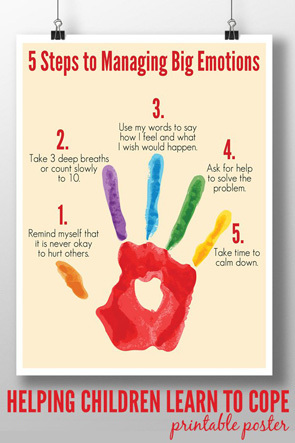 While Take 5 Breathing addresses the stress response, our children need to know that their big feelings are important and we do want to hear what is going on for them. There is a difference clamping up and shutting our feelings away and calming down so that we can talk about our feelings and express them in a safe way. 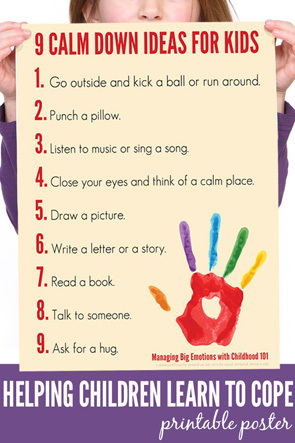 If children feel angry, hurt or worried, their feelings will probably still be there once they have calmed down. That makes it the perfect time to connect, reassure and listen to your children. To download and print your poster: Click on the poster image below. This will open a larger PDF version that you can download to your own computer. Open the PDF and print. When printing, select “Fit to printable area” (or similar) to ensure the page fits with your printer type and local paper size (these have been created at A4 size). I printed ours onto matte photo paper. Personal, non commercial use only. 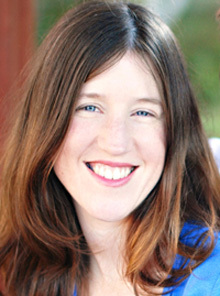 About Leonie: Leonie MacDonald is a qualified primary teacher, a Relax Kids coach and mother of two boys aged 9 and 6. She lives with her family in Canberra. Leonie loves cooking, growing her own food with occasional success, knitting, craft, making gifts, reading and meditation. While mothering a sensitive, easily over stimulated and overwhelmed toddler, Leonie realised that the same relaxation and meditation techniques she had learnt in pregnancy could help children to cope with stress and unwind. So she began to create her own simple bedtime meditations and massage to help her children fall asleep. During this time Leonie discovered Relax Kids products and began to use these to bring calm into her home. Massage and meditation helped Leonie to gently wean both her children and continues to help them to relax and unwind. 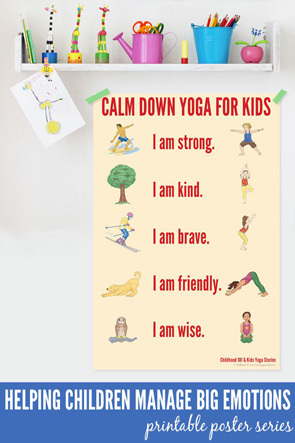 Now Leonie runs her own Relax Kids classes in Canberra, providing children with the opportunity to learn and benefit from yoga-based stretches, peer and self-massage, breathing techniques, positive self-talk, mindfulness and meditation in a positive, creative and fun environment. Leonie also sells relaxation and meditation products for children, books for families and pregnancy and birth products including her book “Birth Journeys – positive birth stories to encourage and inspire”. These products are available here. Connect with Leonie via the Relax Kids Canberra Facebook page. I would like to get emails from you and wants to be in touch with you . Please add me to your list to receive emails of your posts. Thanks so much. I hadn't thought to practice calming techniques BEFORE anyone becomes upset, but it makes so much sense! We have students role play and practice what to do in difficult situations such as bullying, it only makes sense to have them practice personal emotional skills, as well. Thank you for the article! I am so glad that you found it a helpful suggestion. I would like to receive emails from your posts too. I find them so helpful. Thank you so much. I work as a middle school counselor. Can these posters be used school wide? Any chance you could make a version of this with a plain white background so it can be printed on colored paper? Pretty please? The technique of breathing in yoga is known as pranayama. Its derivative is from two Sanskrit words, ‘Prana – breath/life force and Ayama – restraint/control.’ Control and coordination are vital in asanas.